Known as the poblano in its fresh, green state, this rich, slightly fruity flavored chile is the sweetest of the dried chiles. 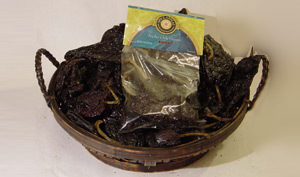 Translated literally as “wide” chiles, this deep, reddish brown chile has a mild and slightly bittersweet taste. An essential ingredient in Mexican sauces and moles. Excellent for making red chile sauces, enchilada sauce, chile con carne, posole, menudo, and huevos rancheros. 3 Heat Rating.